There's a lot more to Wonder Woman than the obvious. It's a magnificent superhero vehicle, a sparkly love story, a touching coming-of-age and a befitting hurray to girl power, notes Sukanya Verma. There's been an influx of broody superheroes, holier-than-thou superheroes, irreverent superheroes, vainglorious superheroes, bewildered-by-their-newfound-abilities superheroes and grappling-with-the-moral-consequences-of-their-actions superheroes. But for the first time in a long time, there's a superhero who actually likes the job. At last, DC's 75-year-old comic book character has her own movie. While it's a pity it didn't happen any sooner, you feel a lot less indignant about the delay on discovering just how wonderful it is. 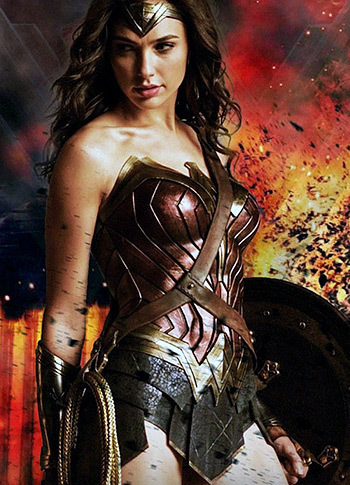 Directed with wholesome ardour for the source material by Patty Jenkins, Wonder Woman is an awe-inspiring combination of wit, warmth and wallop that's found a smooth, sensitive, sinewy embodiment in real-life goddess Gal Gadot. Most of us will remember Gadot's scene-stealing appearance in the unfortunate Justice League prelude, Dawn of Justice; her full-fledged incarnation of the Amazon Princess more than lives up to that promise. Jenkins, who previously helmed Charlize Theron's Oscar-winning turn in Monster, treats the origins story of Diana Prince (Gadot) as an opportunity to time-travel and reveal the romantic and humanitarian behind a gallant albeit inexperienced demigod. As the sheltered warrior princess residing in Themyscira, a picturesque island that adheres to a strict no-guys policy, Diana grows up to be curious about what lies beyond the known in the tradition of Disney heroines like Ariel, Merida and Moana. Not entirely convinced of her mother Hippolyta's (an underutilised Connie Nielsen) distrust for mankind, she's more in tune with the battle-ready vigour of her combat tutor and aunt General Antiope (a superb, swashbuckling Robin Wright). For all her training and textbook knowledge, Diana is a restless, inquisitive soul yearning to be a lot more independent than she's allowed to be. But when WWI spy Steve Trevor (Chris Pine) crashes his plane on her island, her desire to leave and lend a helping hand to the 'one war to end all wars' hits its peak. Even when engaged in dangerous missions to tackle the evil German army chief General Ludendorff (a growling Danny Huston) and his creepy-faced consort Dr Poison (Elena Anaya, dark and mysterious), Wonder Woman doesn't forget to have fun with its rom-comish premise. If Trevor is tickled by the misandry of Amazons and views his captivity as a classic male fantasy, Diana belittles men as a means of procreation not pleasure and scoffs at the conservatism of the modern world that stifles a woman inside clothes and counterview. But Diana doesn't have to compromise on her womanhood or be more man-like to assert her strength. She jumps joyously at the sight of a baby, slurps on her first ice cream cone like a child, allows her heart to take over her heroics and is, most importantly, always herself. Love is her credence, not weakness. Wearing her idealism as boldly as her weapons -- tiara, gauntlets, sword and lasso -- Diana wields them with ferocity and single-minded purpose to execute the elusive Ares, the God of War (not knowing who plays him is the real twist in the tale). Investing the viewer in Wonder Woman's genuineness and growing affinity to Trevor -- blue-eyed Pine plays him with a self-possession and levity that's at ease around Diana's bravado as it is about his own limitations -- fascinates Jenkins more than the urge to throw in action pieces at the frequency of an average super hero flick. At the cost of stunted villainy, such prudence has a staggering payoff. When Diana finally jumps into the scene of action in, but, of course, no man's land, she's dodging bullets, demolishing battalions, devastating church roofs and her passion cuts as deeply as her sword. It's an exhilarating, epic, etched-in-stone moment of DCEU history. Fascinating how Jenkins enforces the ideals of empowerment by emphasising on the idea of balance in the face of one gender's refusal to engage and another's insistence to dominate. When Trevor and his friends are relegated to the background and Diana takes lead, there's realism to this strategy. And simplicity -- she's better at it, way better. What's wise on Jenkins' part is she never bounds Wonder Woman to a statement. There's a lot more to it than the obvious. It's a magnificent superhero vehicle, a sparkly love story, a touching coming-of-age and a befitting hurray to girl power.